Three minutes before the time announced for the beginning of the proceedings of the first Dáil Éireann on 21 January 1919 Count George Plunkett, attended by his colleagues entered the Round Room of the Mansion House, Dublin (continued from last week’s column). They proceeded to their seats. The audience rose and indulged in loud and prolonged cheering. A roll call of members, available from the Oireachtas archives, lists the Sinn Féin MPs in attendance: Seán T O’Kelly (College Green), P O’Maile (Connemara), J J Walsh (Cork City), Michael Collins (South Cork), Seán Hayes (West Cork), Eoin MacNeill (Derry City and National University), Joseph O’Doherty (North Donegal), Peter J Ward (South Donegal), Joe Sweeney (West Donegal), George Gavin Duffy (South Dublin), Philip Shanahan (Harbour Division Dublin), Richard Mulcahy, Clontarf, Dublin, Michael Staines (St Michan’s, Dublin), Alderman Tom Kelly (St Stephen’s Green, Dublin), Piaras Beasley (East Kerry), Dr John Crowley (North Mayo), Donal Buckley (North Kildare), Con Collins (West Limerick), J J O’Kelly (Louth County), Eamonn Duggan (South Meath), Kevin O’Higgins (Queen’s County), Count George Noble Plunkett (North Roscommon), Harry Boland (South Roscommon), James A Bourke, (Mid-Tipperary), P J Moloney (South Tipperary), Cathal Brugha (Waterford), Roger M Sweetman (North Wexford, Dr Jim Ryan (South Wexford), and Robert C Barton (West Wicklow). Journalists from papers such as the Cork Examiner and the Irish Independent jotted down the proceedings, which were passed by a press censor. On the motion of Count Plunkett, seconded by Mr P O’Maile, Mr Cathal Brugha was moved to the chair amidst much applause. He spoke about doing important work, “the most important work that had been done in Ireland since foreigners landed in that country”. Continuing he noted: “It is also a holy work. The people of Ireland have hope and trust in God, and for that reason they might humbly ask God to give them help in the work that they had undertaken”. He then asked Fr Michael O’Flanagan to give a blessing on their work. The Chairman then called the names of all the Irish Parliamentary representatives invited to assist the establishment of the Dáil Éireann. 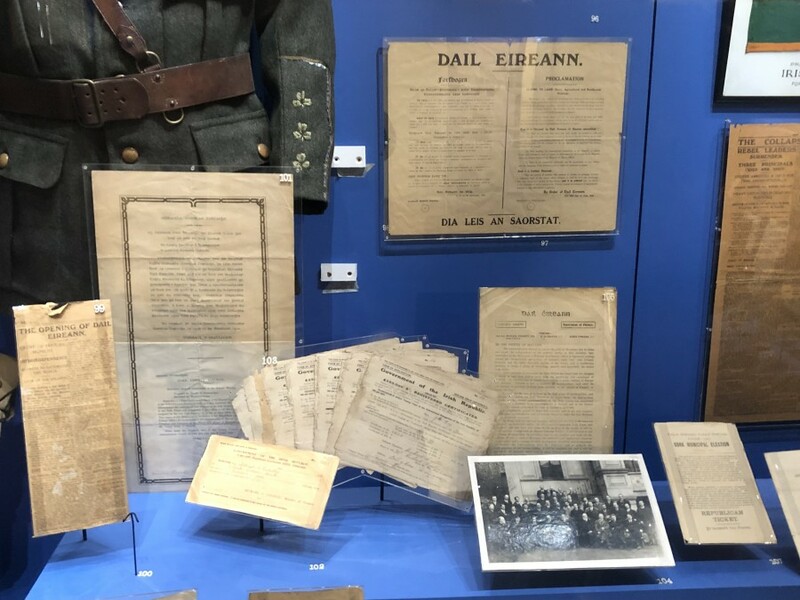 The Chairman highlighted that invitations had been sent to all persons elected for Irish constituencies in the December general election of 1918. There were no replies when the names of Unionist members were called and in the case of the Sinn Féin members in prison the answer “in gaol” was given”. Mr Seán T O’Kelly then proposed the adoption of a temporary constitution. He said this constitution was a very simple one; “all the members of the Dáil have already got it in their hands, it did not require any long advocacy of it from me. It is sufficient for the time being for the purpose which the Dáil holds in view, namely, to make a permanent Republic in Ireland”. Sean Hayes seconded the motion, which was unanimously carried. The Chairman read the Declaration of Independence to be endorsed by the Dáil. The declaration was read in English by Mr E J Duggan, and in French by Mr George Gavin Duffy. It was accepted by each MP present. On the motion of Mr O’Maillie and seconded by Dr Jim Ryan, Eamon De Valera, Count Plunkett, and Arthur Griffith were appointed delegates to the Peace Conference. Mr J J O’Kelly read an address to the “Free Nations of the World”. Count Plunkett read the address in Irish. Mr John MacNeil, who proposed the adoption of the address, said they were not asking the people of other countries to establish a Free State in Ireland, because he deemed that the state had already been established. All they asked was that it should be recognised and guaranteed by the “Powers” which were assembled in Paris to settle the peace of the world and granted the rights of small nations. Mr J J Walsh from Cork City seconded, and the motion was unanimously carried. The constitution of the Dáil was then read and also agreed to. It provided that the Dáil should have full legislative powers and should consist of members elected by the people from the existing constituencies; “Full Executive power shall reside in the Ministry, which shall consist of a Prime Minister selected by the Dáil, and four Ministers, namely, Ministers of Finance, Foreign Affairs, Home Affairs, and Defence. The Prime Minister shall nominate the four, and have power to deprive them of office. A Ceann Comhairle (Speaker) shall be selected, for the year by the Dáil, ‘ or a substitute if he is not present. The Ministry shall receive whatever money they require by vote of the Dáil and will be responsible to the Dáil for the monies voted”. Provision was made for the-auditing of the accounts, and the Constitution provided that was temporary, and could be changed by written resolution submitted on ten days’ notice. Mr Piaras Beasley read in Irish, and Alderman Tom Kelly in English, the democratic programme of social and economic principles. Mr Richard Mulcahy moved the adoption of the programme. Mr Con Collins seconded the motion which was carried. The sitting was then adjourned till the following day when Standing Orders were to be under consideration. As the members of the Dáil rose in their places for the adjournment they were loudly applauded, and the cheering was renewed by the crowd outside the Mansion House when they left the building. The crowd then quietly dispersed. At night a reception was given by Mr Cathal Brugha, Speaker of Dáil Éireann.